Aggregated final produce of small maize farmers ready to be shipped in Odisha, India. Since 2013, the Cereal Systems Initiative for South Asia (CSISA) has been sustainably intensifying kharif maize cultivation in a rainfed ecology on the north-central plateau of Odisha, India, in Mayurbhanj and Keonjhar districts. Through the promotion of better-bet agronomy (e.g., suitable hybrids, line planting, nutrient and weed management), maize yields of adopter farmers in Mayurbhanj and Keonjhar can reach 5.4 t/ha, up from an average of 2.5 t/ha. In collaboration with the Odisha State Department of Agriculture, CSISA scaled up sustainable intensification practices on 5,227 hectares in 2018, from almost zero five years ago. 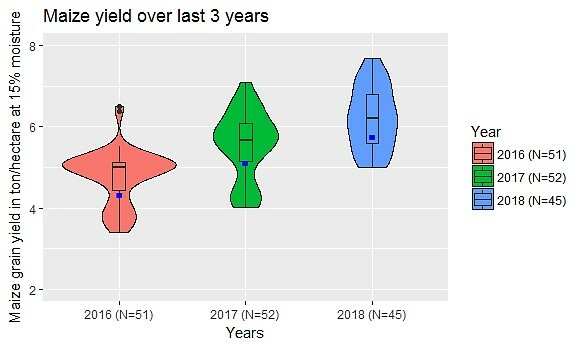 Random cuttings by CSISA over the last three years on farmers’ fields showed that maize yields have consistently improved and become more uniform (as shown in the accompanying violin plot), both of which are required for farmers to strengthen their market linkages. Unfortunately, farmers have not been able to translate their increasing harvests into higher returns due poor linkages with output markets. Although large institutional grain buyers such as hatcheries and feed mills are located nearby, in the past they were not interested in procuring maize grain locally because farmers produced a relatively small marketable surplus and grain quality was uneven. Efforts had been made earlier to improve maize grain marketing, but these efforts only partially succeeded because some interventions were not equitable and some were not scalable. Private aggregator-based models favored middle marketing agents over farmers because prices at the farm gate were low compared to prices at the industry gate. Models focused on individual farmers generated high transactions costs at the buyers’ end. Therefore, a mechanism was still required that could ensure benefits to farmers but also be convenient for large buyers. Before the 2018 maize planting season, CSISA held brainstorming sessions with the Odisha State Agriculture Marketing Board and the Department of Agriculture and Farmers’ Empowerment to devise a transparent, farmer-friendly, scalable marketing mechanism that would also be attractive to buyers. In response to the discussions, CSISA began organizing the maize farmers into groups. The farmers’ groups cultivated maize on a consolidated patch, which helped ensure uniform cultivation practices and standardized postharvest activities. Training sessions and follow-up backstopping encouraged timely harvesting, mechanical threshing and adequate grain drying. These practices were essential for matching grain quality to industrial specifications (less than 14% grain moisture and not more than 1% fungus-infected grains). The maize-producing groups had committed to selling their harvest together, in bulk. Prior to the maize-harvesting period (Oct. – Nov.), CSISA and the local administration convened a meeting of potential large buyers. At this meeting, buyers agreed to purchase the grain at US$ 240/ton (if grain quality meets standard industrial parameters), the Government of India’s current minimum support price. In November 2018, Maa Ganga Maize Producer Group, composed of 20 women farmers, sold 22.3 tons of maize grain to the local hatchery and generated a gross revenue of US$ 5,330. 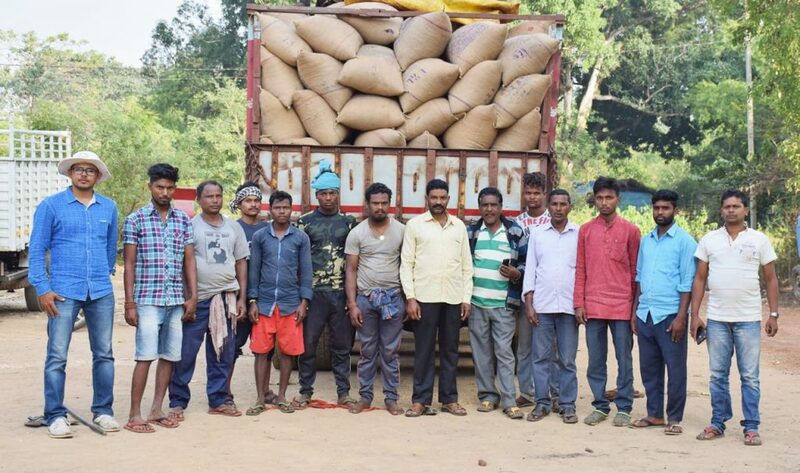 Another group of 21 farmers sold 25 tons and made US$ 5,985. These amounts were shared amongt member farmers in proportion to the amount of grain they contributed. Venkateswara Hatcheries Pvt. Ltd., the biggest buyer of maize in the region, alone purchased more than 200 tons during the season. Other buyers then followed suit (information about total production and sales is currently being compiled). In contrast, farmers who had not joined a producer group sold their produce at around US$ 180/ton. CSISA plans to bring all maize growers of this area onto the same platform so that they can also obtain the economic gains that can be generated by adopting sustainable intensification practices. 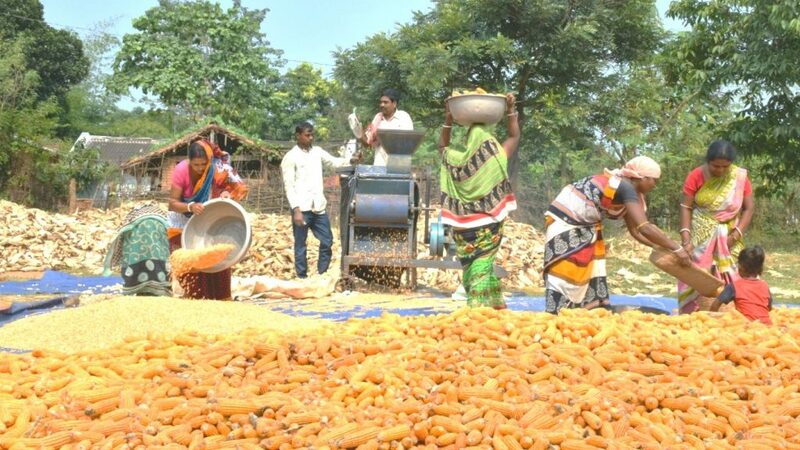 Women farmers threshing their maize harvest in tribal part of Odisha, India.